Researchers from the University of Tokyo recently published a study in the journal Biological Research for Nursing on the possible connection between folic acid intake and oxidized LDL (low-density lipoprotein). Prior to the study, researchers believed the total homocysteine could also play a part in the connection. More than 135 singleton-pregnant women with an average age of 30 were included in the study. Data were collected via questionnaire. 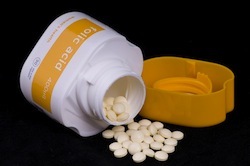 Women who took supplements that contained folic acid measured lower oxidized LDL levels compared to women who did not supplement with folic acid. There did not appear to be any connection with total homocysteine. Conclusion: Folic acid supplements may reduce oxidized LDL levels. Doctors can use the information revealed via this study to formulate proper pregnancy diet guidelines. Increasing dietary intake of folic acid prior to and during pregnancy could effectively reduce risk of preeclampsia based on oxidized LDL levels in the study. Source: Shiraishi M, Haruna M, Matsuzaki M, Ota E, Murayama R, Watanabe E, Sasaki S, Yeo S, Murashima S. Association Between Oxidized LDL and Folate During Pregnancy. Biol Res Nurs. 2013 Apr;15(2):213-8. doi: 10.1177/1099800411427581. Epub 2011 Dec 15.